Sony has always been a avid supporter of using top of the line physical storage media for their devices, for instance the PlayStation 2 was the first console with DVD drive, the killer feature of PlayStation 3 has always been the Blu-ray drive and the first-gen PlayStation Portable brought the new UMD media format. But recently, Sony killed UMD format with the PSP-Go in favor of distributing media over their online PlayStation Store. This obviously raised a lot of questions whether Sony will take PSP-Go like route for the next-gen PlayStation 4. Well apparently, this might not be the case after all. 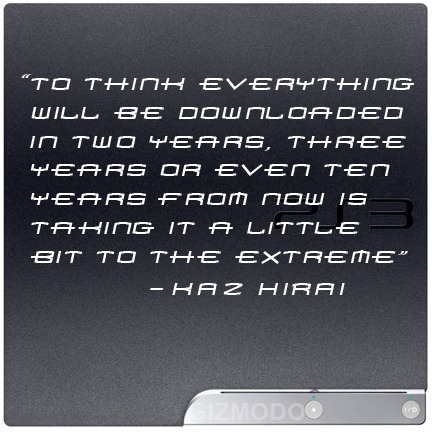 To think everything will be downloaded in two years, three years, or even ten years from is taking it a little bit to the extreme. digital future is over ten years away. Well, the size of the games and the speed of broadband outside City’s or all of the UK this is true. It will be 10 years before speeds allow 10gb + games to be downloaded in a sensible time! Well, I would not sign that and making such a statement is also little bit imprudent.. Just think about how it was 10 years ago and how it is now. It hard to predict how and how fast the technology is evolving at this time. Would you have believed it if I told you 10 years ago that apple would be market leader on the phone market in 10 years? Also, it depends on what the other developers, the business competition is doing. They have to react to them. This is also why Microsoft and Sony now have similiar controllers to the Wii Remote. Or just imagine, Samsung or HTC would say “Touchscreen Smartphone? No way, we’re doing our thing.” Do you think they would be as sucessful as they are now? There are much more reasons why you shouldn’t give such a statement, the two above were just the most obvious ones. 10 years ago Apple had 0% of the phone market, ten years on they have 5% of the market, hardly a market leader, I think it is very easy for consumers to include ipad and ipod touch in this sector ( I have an iPhone and my Daughter an Ipod Touch) I also run an phone accessory business, one thing is clear Nokia have lost their way and market share but, others including htc, Samsung, sony ericcson have started to bring product to market that people really like and can and sometimes do beat apple’s iPhone. What apple really has a market lead in is the app market, huge amount ahead of everybody else, but again other companies will learn, I think Microsoft already has the infrastructure and knowledge to really kick its app into store in to gear next year through its xbox live marketplace, Andriod is the one to watch, now if you would have said to anyone 10 years ago Google would be rising star in mobile phone os market they would of said who?……. Actually, technology advancement is one thing. But Verizon will not give us 10GB/s connections anytime within the next few years… FOR LESS THAN $1000 A MONTH!